This August we made two fast passages across the English Channel on an open 8 metre RIB. 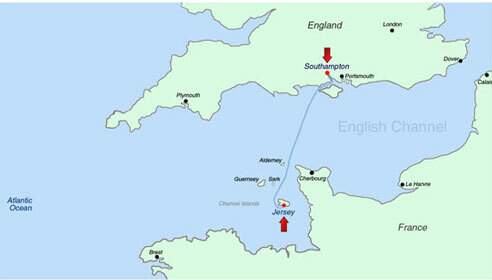 It is a superb run from Southampton UK to St Helier Jersey in the Channel Islands. On both legs we had a variety of sea states, taking 6 hours to cover 125 miles at an average speed of 25 knots. Heavy rain in Northern Europe and changing conditions in the English Channel required a weather window for both legs. The English Channel is one of the busiest shipping lanes in the world, with ships transiting to and from The North Sea, Scandinavia and The Baltic. On French charts it is known as La Manche. From the low vantage point of a RIB there is always a section of the crossing where no land is visible – and these waters are known for poor visibility with fog a particular challenge around Cherbourg and the Channel Islands. Crossing the Channel from the The Isle Of Wight on the UK side to the Cherbourg Peninsula on the French side is around 60 miles. The shipping lanes are around mid-channel, with a separation zone between them. On both days, we passed ships going east and west, then empty seas from Cherbourg peninsula to Jersey. On the return leg the first 60 miles was heading north through the Channel Islands leaving Sark and Guernsey to the west. When we reached the notorious Alderney Race we knew the tide would be running against us. In these conditions 'The Race' stretches 10 miles from Cherbourg peninsula to the island of Alderney and 5 miles north to south. 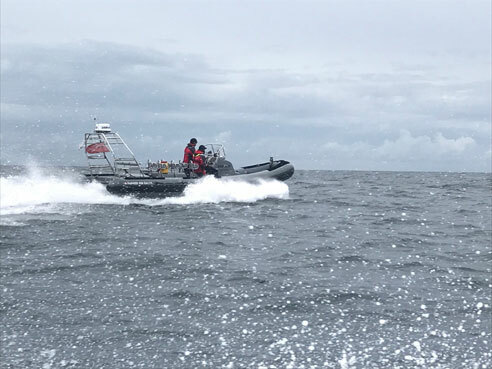 The twin inboard diesel RIB appeared to be running at well over 25 knots in moderate seas - but the 6 to 8 knot south going Spring tide brought our speed over the ground down to 20 knots. As the English Channel drained - whirlpools and eddies formed around us flattening the disturbed waves to perfectly smooth circles of glassy water over 50 metres across. That day we were the only vessel on this incredible piece of ocean. These fast RIB passages in waves give a unique opportunity to gather data that can be analysed to improve professional operations. Besides the navigation data showing course and speed, GPS was used to sync onboard devices. A Dyena accelerometer on the deck measured vibration, a GoPro on the rear A-frame gave video and audio with the helmsman wearing a Garmin heart rate monitor. 'Grey Mist' is an 8 metre Parker Baltic RIB with twin 2 litre 170 hp Mercury diesels linked to Bravo One stern drives. The wide beam deep V hull gives a dry ride, handling waves and turns in a very predictable manner. Seating is on jockey seats with wraparound bolsters. Skydex cushion decking provides excellent grip and shock mitigation when standing. The windscreen works well and there are plenty of handholds for moving around the boat or when the going gets rough. The twin diesels are responsive and the stern drives are well matched to the hull and engines. 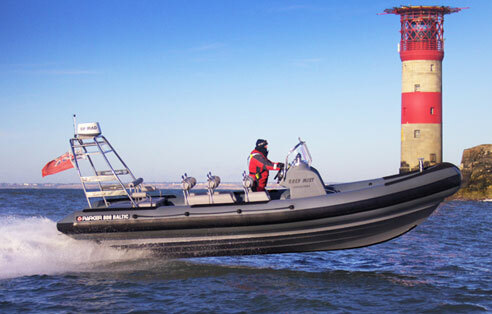 The RIB is built to commercial specifications and is set up for offshore passages. The cruising speed is 25 to 30 knots for maximum range. When required the boat will run at 40 knots. Outbound ETA: 16.30 at St Helier (arrival 15 mins before). Inbound ETA: 16.30 at Needles Fairway (arrival 10 mins after). Navigation: Digital chart plotter / compass / laminated charts. Weather: Shipping Forecast / Inshore Waters / Metcheck / BBC.